Before the Army’s 25th Infantry Division, stationed at Schofield Barracks on Oʻahu (formed in 1941,) for a while during the time of World War I (1913 – 1918) Hawaiʻi had the Army’s 25th Infantry Regiment. In 1866, Congress created six segregated regiments which were soon consolidated into four black regiments. They were the 9th and 10th Cavalry and the 24th and 25th Infantry. Rather than fight, the Buffalo Soldiers and other Army regiments were assigned to duties at some National Parks. Starting in 1906, George Lycurgus (operator of the Volcano House) and newspaperman Lorrin Andrews Thurston were working to have the Mauna Loa and Kilauea Volcanoes area made into a National Park. In 1912, geologist Thomas Augustus Jaggar arrived to investigate and joined their effort. About 800 Buffalo Soldiers from the 25th Regiment had been assigned to garrison duty in Hawaiʻi at Schofield Barracks. Given their experience in Parks on the continent, some of the soldiers were called upon to assist at the volcanoes on the Island of Hawaiʻi. In September 1915, Jaggar, Thurston and a US Army representative conducted a survey to determine a route for a trail up Mauna Loa. The Buffalo Soldiers built the 18-mile trail to the summit of Mauna Loa. They also built the ten-man Red Hill Cabin and a twelve-horse stable, so scientists could spend extended periods of time studying the volcano. On August 1, 1916, President Woodrow Wilson signed the country’s 13th National Park into existence – Hawaiʻi National Park. At first, the park consisted of only the summits of Kīlauea and Mauna Loa on Hawaiʻi and Haleakalā on Maui. Eventually, Kilauea Caldera was added to the park, followed by the forests of Mauna Loa, the Kaʻū Desert, the rain forest of Olaʻa and the Kalapana archaeological area of the Puna/Kaʻū Historic District. The National Park Service, within the federal Department of Interior, was created on August 25, 1916 by Congress through the National Park Service Organic Act. Later, in the 1930s, the Civilian Conservation Corps (CCC) built research offices, hiking trails and laid the foundations for much of the infrastructure and roads within the Hawaiʻi Volcanoes and other parks across the country. On, July 1, 1961, Hawaiʻi National Park’s units were separated and re-designated as Haleakalā National Park and Hawaii Volcanoes National Park. Oh, one more thing … another lasting legacy of the Buffalo Soldiers to the National Parks is the Ranger Hat (popularly known as the Smokey the Bear Hat) – with it the Montana Peak (or pinch) at the top of the hat; a recrease of the Stetson hat to better shed water when it rains. 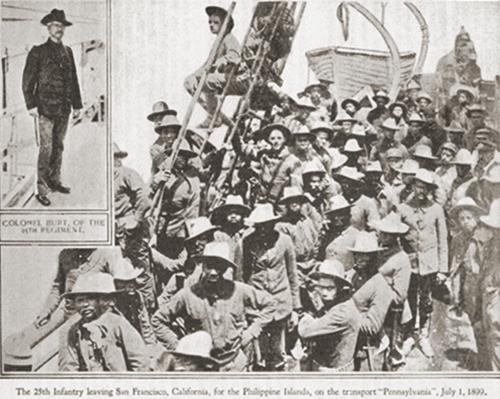 The image shows members of the 25th Infantry Regiment while deployed to the Philippines (1899.) In addition, I have added related images in a folder of like name in the Photos section on my Facebook and Google+ pages.